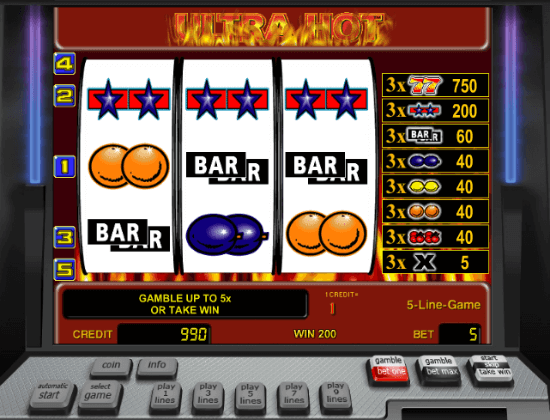 Ultra Hot is one of those classic 3 reel slots that were the heart of every casino. Of course it was long time ago and there are plenty newer, flashier slots for players to choose from, but Ultra Hot slot is one of those games that never go out of style and always fun to come back to. It’s not as successful as Book of Ra, but definitely within top 3 most popular Novomatic slots. There are 2 versions of Ultra Hot slots which you can play online: the classic version, which we will review here, and the Ultra Hot Deluxe – a newer version of this game which you can try for free. Both games offer similar payouts and features, the only difference is the design. When Novomatic developed the Ultra Hot slot online version, their main target was to bring online the experience of a real live casino and that’s what they did. 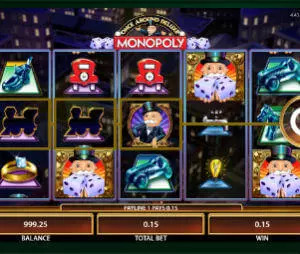 The slot is exactly the same as what you will find in any brick and mortar casino, from the symbols and payouts to the layout of the control buttons. Naturally, it has its pros and cons. The pros are clear – we can play our favorite casino slot from the comfort of our leaving room. The drawback is that the layout and the buttons are not adjusted for online play and take time to get used to. Ultra Hot features 5 fixed lines. It uses all the familiar symbols which you can find in many classic slots: cherries, oranges lemons, bars, stars and sevens, (which are the highest paying symbol of the game). There are no wilds or other special symbols and you just need to get 3 similar symbols inline to get paid. The payouts of Ultra Hot slot are not very frequent, but if you are lucky to hit the 7s or the Stars, you will win some nice cash. Unlike many 3 reel slots which benefit high rollers, the payouts of Ultra Hot are not affected by the denomination or the number of coins you bet per line, which is great for penny slots fans.